Below are the books that are pictured above that I currently own and reference for issues that arise. 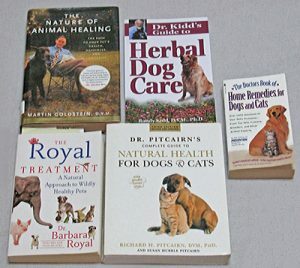 Four of the five books were written by holistic vets and while the smallest book is mostly conventional treatments and advice, there have still been times where a remedy in the book has presented a different, yet reasonable and safe treatment the other books did not. Because there are so many issues that these books address, I just picked three common issues to give you an idea what, if any, information is provided on the topic in each book. To keep the confusion to a minimum during the review process, I refer to the books by the name of the holistic veterinarian who wrote them, except in the case of the ‘Prevention’ manual, which will just be referred to as ‘Prevention Manual’. In his book, Dr. Goldstein covers a lot of background on fleas, including why they are so bad nowadays, how important a healthy diet is for keeping them away and the fact that your pet having them in the first place warrants a vet visit to get to the root of the problem. But where his book really shines is where he actually lists the name of the products that he uses for combating the fleas and the allergy response they cause in some animals. Dr. Goldstein also discusses the history of flea products and their dangers that he has witnessed in his own practice. In all, while a lot of the information is scattered throughout the book, there is a lot of interesting information about the topic and it is nice to see what products he actually recommends by name for treating your pet and your home. In his book, Dr. Kidd admits that there is no herb that is effective for killing fleas, so his approach is to strengthen the immune system and add deterrents like garlic to the diet. Very basic information and the same information covered by the other books. Dr. Royal only offers up a few bits of information such as limiting any flea treatments when possible, as well as how she recommends they be applied, but she really offers up no holistic treatment advice. Dr. Pitcairn goes even further than Dr. Goldstein did in his book by explaining things like just how simply brushing your pet is helpful in discouraging fleas and bathing information including how often and key ingredients to look for or avoid. He also provides a lot of safe flea control measures as well as the dangers of particular insecticides in a table format with possible long-term effects listed. Almost every aspect of the flea experience is covered by Dr. Pitcairn, so I can’t imagine any other book on the market being as thorough in safely treating fleas on your pet and in your home. The Prevention Manual has some pretty good, yet basic tips regarding treating fleas, but they aren’t all exactly super safe like Dr. Goldstein and Dr. Pitcairn’s methods are. A big difference that I did notice, was that this book made no mention at all of the health of the cat or dog, or it being related in any way to the infestation. However, the tips are probably helpful enough to rid your pet and home of fleas and if the recommendations are followed, kept away, so long as your pet doesn’t have some underlying health issue that is compromising their immune system. In his book, Dr. Goldstein discusses heartworms, his experience with them, and treatment and prevention protocol, including products he recommends and the dosage. He also discusses intestinal worms, his thoughts on conventional wormers and what product he recommends to those who prefer a herbal wormer and what to do to help get rid of not only the worms, but to clean out the intestines afterwards to prevent a breeding ground for them, including product recommendations. In his book, Dr. Kidd had no information for any type of worm. In her book, Dr. Royal briefly touches on heartworm treatment schedules by location and even less on intestinal worm treatment. She offers no product recommendations or further comment on the subjects. Dr. Pitcairn discusses heartworm statistics and the dangers both the worms (if there are enough of them, which is not always the case) and treatments can cause, as well as gives some prevention ideas with food recommendations. He does, however, seemingly prefer to go the full herbal and homeopathic route in his book on intestinal worms, giving full details of how worms are transmitted, their symptoms, how to treat them with various non-conventional methods and general guides on how much of what to administer, with somewhat vague recommendations such as “1/4 tsp. to 1 tsp., depending on the size of your animal” in several of his treatment options. In the Prevention Manual, their treatment approach is definitely more conventional. They recommend all dogs and some cats (including indoor pets) be given heartworm preventative medication with no exceptions given. They also offer up advice for preventing mosquito bites with things like fixing door and window screens and putting up a purple martin house. No holistic treatment is discussed. With intestinal worms, they again only go into more conventional methods of prevention and treatment by recommending keeping the yard clean and not allowing pets to eat mice, rabbits or other rodents. Their treatment advice consisted of telling the reader to go to their vet or a local pet store for pet wormer. Dr. Goldstein did not address this issue in his book in the Index under anxiety, stress or thunderstorms. Dr. Kidd listed herbs for anxiety, but doesn’t elaborate on what kind of anxiety which herbs work best on and no dosage information is given. Instead, he recommends getting a diagnosis from a Dr. first. In her book, while Dr. Royal does not specifically address anxiety from thunderstorms, she does recommend acupuncture for a few conditions, including general anxiety. She also recommends acupressure, with a description of where to touch the animal, as well as herbal options for anxiety with dosing instructions for both tinctures and granule/powdered forms. When I was looking up ‘Thunderstorm’ in the index, I noticed while she has no section where that is addressed, she does reference the ‘Thundershirt’ http://amzn.to/2sN8iSo and says it is highly effective and good for easing anxiety. Dr. Pitcairn does mention stress for pets, but nothing pertaining to how to deal with a dog that is suffering from thunderstorm related anxiety/stress. Prevention Manual has a lot of tips for easing anxiety and fear of noise in a dog, including giving them space, desensitization, and a cross between massage and acupressure to their ear. They also recommend a particular product by name that may help. Having used all of these books either together or on their own to formulate a treatment plan on a few different occasions, it is hard for me to recommend just one or two, since not every topic is always covered or to the degree that I am looking for, as demonstrated above. I also like learning why each vet feels the way they do, usually based on facts I didn’t know, or their own experience treating patients in their clinics. Dr. Goldstein and Pitcairn excel in that area, but Dr. Goldstein and Dr. Royal are better at giving more exact dosing information for some things, which is helpful when you do not have access to a holistic vet. Even though Dr. Goldstein’s book is from 1999, it is frightening how some things we are experiencing now as an epidemic, like cancer, were already an emerging crisis back then, we just weren’t on the front lines to know about it until much later, when it affected our own pet or a pet of someone we know. And while I have found that some of the products Dr. Goldstein recommended are no longer around, plenty of them still are, as I have researched and purchased them for different ailments he’s recommended. I have also thoroughly appreciated how detailed he is and how he includes dosage amounts for almost every treatment he recommends. On the other end of the spectrum, while pretty basic and not really along the lines of holistic treatment, there have been a couple of instances where the Prevention Manual has surprised me with its solutions to problems. While sometimes quite simplistic in their recommendations for avoidance and treatment, they do sometimes offer worthwhile solutions that the other books didn’t mention. This is probably because the Prevention Manual uses recommendations from several different vets and sources for each ailment/condition, instead of just one, like the other books do, hence having a more diverse pool from which to get treatments and recommendations. I realize it’s hard to tell if a book is right for you based on a very minimalistic review, especially if your issues don’t involve any of the topics I used in this review. To get a look inside the books, just click on the links above after the book names, and you’ll be taken to the amazon page where these books all have a ‘Look Inside’ feature on them where you can read a few pages before buying. You can also check with your local library to see if they are available for checkout so you can peruse the book in its entirety before deciding if it is right for you. However, even if you are only interested in a particular topic, I don’t think you’ll be disappointed if you decide to go with the books by Dr. Goldstein, Dr. Royal or Dr. Pitcairn. All of them discuss important topics like cancer, vaccinations and just general health issues that they see firsthand plaguing our pets due to various things that any pet owner should be concerned enough about to hopefully change the way they care for their pet.